* Broad toe, Grip soles. 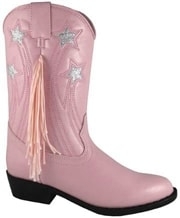 Texas Star Pink child cowboy boots. *WILL SHIP NOW* SIZE 13.5-ONLY HERE IN OUR STOCK. Child size 1 White cowboy boots. WILL SHIP NOW SIZE 2- BEAUTIFUL SOFT PINK SUEDE Girls cowgirl boots. Child size 2 White cowboy boots. 100% Leather Buckaroo cowboy boots.